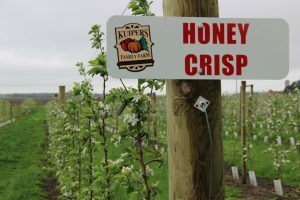 Since 1998, the Kuipers family has invited guests to their beautiful Midwest working apple orchard and pumpkin farm, where you can enjoy the simplicity and beauty of the farm life. Buy or pick the most delicious apples in the world, including the crisp, succulent honeycrisp apples. Honeycrisp apples feature a texture and taste that sets them apart from the rest. The crispness explodes in your mouth with a balance of tastes that come out of a complicated breeding process to develop this perfect fruit. Call 815-827-5200 for complete information about the Apple Orchard at the Kuiper Family Farms, where you can pick, buy and enjoy honeycrisp apples, and assorted related foods and accessories. Buy apples of all kinds and styles and tastes, including the famous and delicious honey crisp apples, direct from the orchard at Kuipers Family Farm. Apples are sold individually, by the full or half-peck bags. Prices vary by supply and variety. If you’re really picky, you can stroll the orchard and pick the apples for yourself. Apple picking season is from August 18 to October 29 or while supplies last, available on Saturdays and Sundays. Wagons and backpacks are not permitted in the orchard. A $10 admission includes and quarter-peck bag of apples and a fun hayride to the grove, weather conditions permitting). Children 2 years old and younger are admitted free, but will not receive an apple picking bag. While at the Kuipers Family Farm to pick and buy your favorite honeycrisp apples, follow your nose to the Orchard Bakery to pick up some of our famous apple cider doughnuts, home-baked pies, cream and butter fudge, and much more. Watch as we hand-spin a caramel honeycrisp apple just for you. And for a true taste of fall grab a gallon of our freshly-pressed pasteurized apple cider.